The Rent Party @ Vagabond’s, was the place to be this past Sunday. Vagabond’s, a Miami hotspot is the venue for the Rent Party, a once a month event held on Sundays and is a place where you can meet and mingle with the most beautiful looking people, check out the vendors for your next outfit, grab some bbq right off the grill or listen to some real good music. On this fabulous summer night at this chic outdoor venue, King Leo Promotions came out to check out Kehv. Kehv, if you’ve never heard of him, get use to the name because….you will!!!! 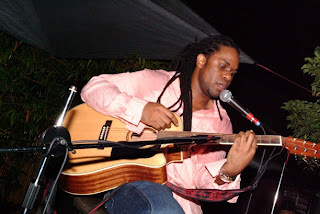 Kehv, the “Prince of Reggae Soul” blessed the stage and gave us tracks after tracks of his memorable music. From “Distant Lover” to “Hear you say”. He even got out his guitar and bless us with some of his original acoustics music, including “Never too Far” recorded by Born Free. It was truly a good time to be had by all.